Tam Coc in northern Vietnam, 100 kilometres south of Hanoi, is an experience truly worth the trip. Vietnamese in traditional conical hats row colourful wooden boats using foot power. Dramatic limestone mountains rise above rice paddies as tourists glide along the Ngo Dong River. The fleet passes through three grottos (which Tam Coc is named for) carved by thousands of years of river flow. 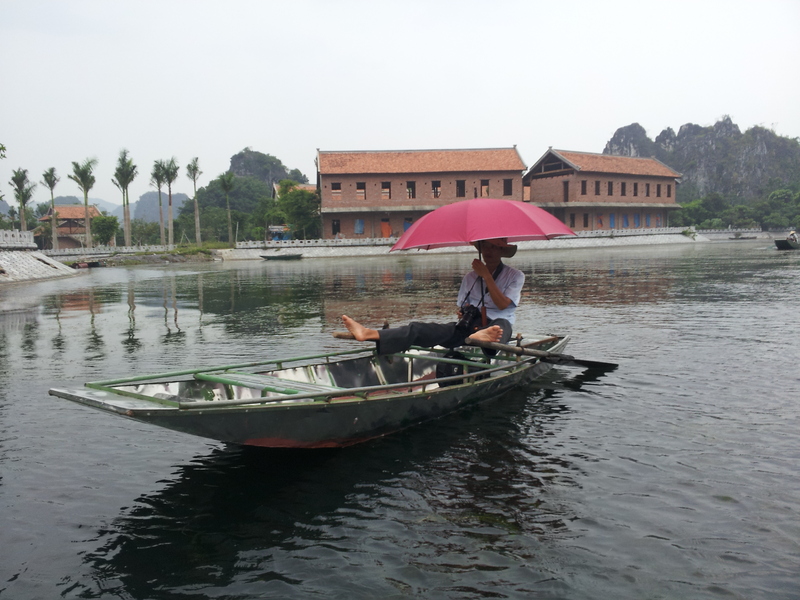 Local villagers become rowers by foot in the tourist season to earn their living following the harvest. Fascinated by his dexterity, close inspection reveals how my boatman cups his bare feet around the oars to control the forward and back motion. Drifting to the river bank, we disembark and wander through rice paddies surrounded by green before returning to our landing point. Stalls line the street displaying bargains - T-shirts, jewellery, hand-sewn purses, bags and bookmarks. Haggling is acceptable, but visitors should remember that 20 000 dong equates to one Australian dollar. The enormous numbers in Vietnamese currency can be confusing. You could be quibbling over 50 cents. Hardly seemly given stallholders depend on tourism to feed and house their families. From the start of our journey, we are chauffeured in a luxury Land Cruiser accompanied by our English speaking guide, Duong. 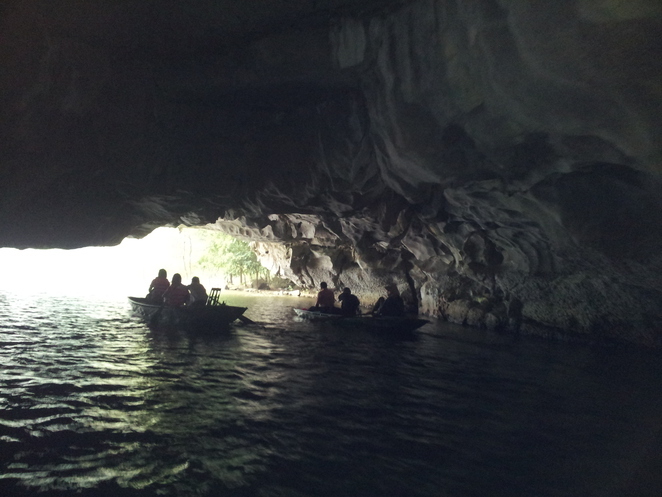 To reach Tam Coc we drive for two hours through Hanoi and the countryside. Our tour costs 1,320,00 dong per person for four or about $60 each Australian. We visit Hua Lu temple at the historic capital of Vietnam's former emperors dating from the tenth century. The stone bridge across waterlily ponds forms a tranquil entry to this sacred precinct. An ancient, wispy white-bearded caretaker in a deep plum costume epitomises Vietnamese grace and dignity. He is fascinated by our ipad and marvels at the images he sees – a juxtaposition of old world and new. 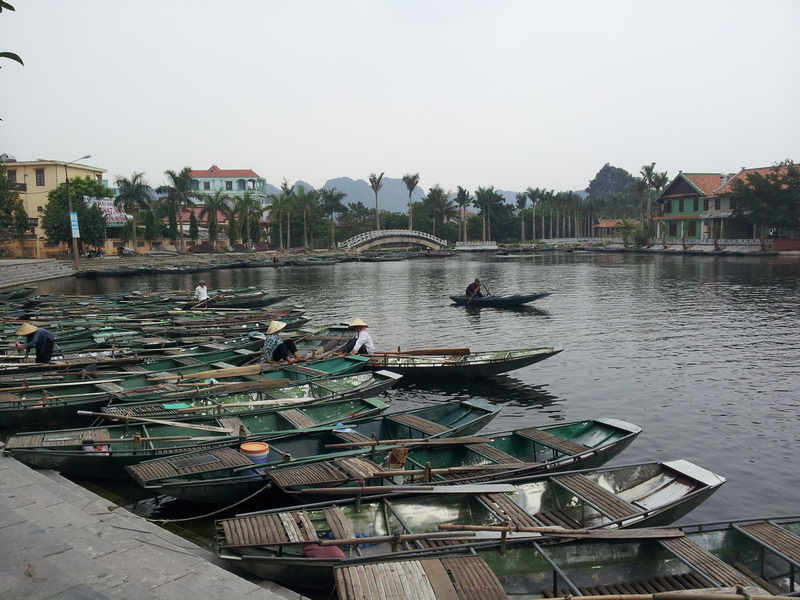 We stay at the new five star Emeralda Resort outside the nearby city of Ninh Binh. 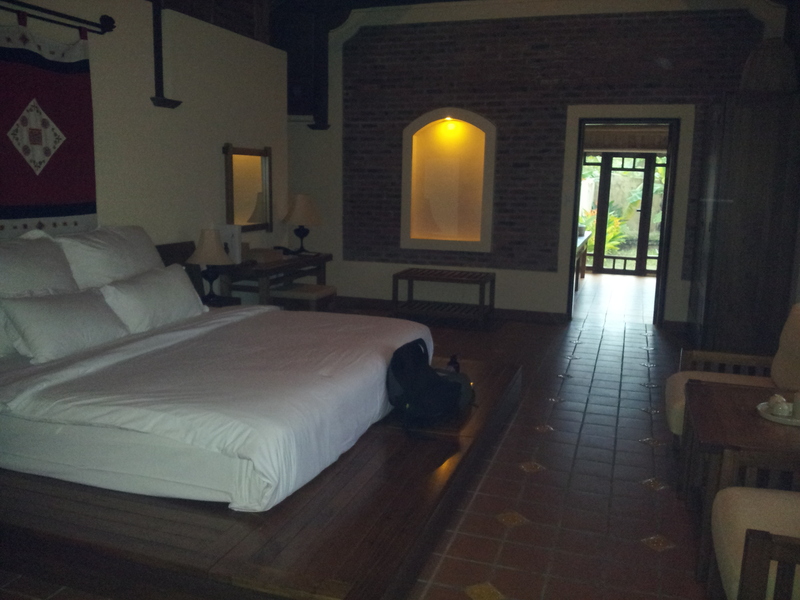 All rooms are generously proportioned with timber furniture and gorgeous Vietnamese woven hangings. Lovely outlooks greet us from bedrooms and enormous bathrooms with private courtyard gardens. Meals are a smorgasbord of western and Asian dishes, including pho noodles, rice, fish, fruit and salads. Duong proposes a bike ride through paddy fields, but the weather turns stormy overnight. A typhoon is forecast to hit that afternoon. The manager advises us to leave. As she speaks a blast of wind rips a door off and it crashes onto the tiles. Thankfully no-one is nearby. This is a lesson to tune in to weather warnings in foreign countries, including in northern Vietnam's typhoon season from July to November. In the hurry and confusion of departure Duong is left behind. Our driver shepherds us into the car, then takes off without him. Protests and gestures are no match for the driver's wordless refusal to turn back. Perhaps Duong's boss insists he remain at the resort during the typhoon, or the driver has his own reasons. It is one of those happenings on a foreign adventure that you never get to the bottom of.